ME (myalgic encephalomyelitis) - also known as chronic fatigue syndrome (CFS) - is an illness that affects an estimated 250,000 in the UK and around 17 million worldwide. It’s a long-term, chronic neurological condition that affects many of the body’s systems - especially the nervous and immune systems. Severe, persistent fatigue is commonly experienced by people with ME/CFS, making the small tasks many of us take for granted extremely challenging. Laura Chamberlain is a writer and the blogger behind Laura’s Pen, a blog that challenges outdated perceptions of ME/CFS and gives a much-needed voice to the voiceless. For this year’s ME Awareness Day we spoke to Laura about her story, her daily habits, and why raising awareness of ME/CFS is so fundamental to the wellbeing of those who live with the condition. When did the symptoms of your ME/CFS first become noticeable? I actually first experienced symptoms as a teenager. When I was 14 years old I was hit by a car. It wasn’t bad; I was just in a bit of shock with a few bruises - nothing horrendous. After the incident, though, my energy levels just crashed and wouldn’t pick up again. I gradually started going more and more downhill: I had more days off school until it got to I point where I realised there was something wrong. The symptoms were only particularly bad for about a year. After that, I became quite high-functioning and was able to eventually go to college. However, I still had to manage the symptoms quite a lot and took a lot more sick days than a normal person. I did gradually go into work, and I thought at the time I’d recovered. In hindsight, I was still managing things - I was just very high functioning. After high stress events like job interviews I would become ill for a few days without having an explanation for my symptoms other than stress. Episodes like this continued to happen and if I got ill it seemed to last a lot longer than it should for a healthy person. "Then I got a chest infection and just couldn’t shake it. I kept coughing and not feeling right. Looking back, it was probably the pollution of where I was living in south London, because the chest symptoms improved when I when moved in with my partner a bit further out of the city. However, the fatigue and things like that started to get worse." On the day of our housewarming party I just didn’t feel right and felt like I was running on too much adrenaline (though I drank a fair amount that night, it was nothing out of the ordinary for your average party). When I woke up the next day, my body felt completely drained of energy and my muscles didn’t feel like they worked properly. Everything was too bright and too loud. I also had a weird symptom of roaming numbness that my GPs never really got to the bottom of. After being referred to a neurologist I was originally diagnosed with functional neurological disorder (FND), which is basically when you experience neurological symptoms that are a manifestation of some trauma or mental health problem. This diagnosis didn’t really make sense, as there was nothing in my symptoms that pointed to psychological causes. Anyway, I took their word for it, and the doctor said I should have two weeks off to rest. I told the doctor I’d already done this - I’d taken two weeks off work and I still felt awful. In response, she suggested I do the opposite: go to the gym and do loads of exercise. How can you just jump from one extreme to the other in your recommendation? It was incredibly frustrating. How did ME/CFS impact your work life? As a journalist, I was expected to keep going out the office and attending events. Despite not feeling right, I just kept pushing through. I managed to go back to work after the FND diagnosis but really struggled to take on all the duties I had previously been responsible for. At this point, things started to get way too much for me. I spent my last day at work hobbling around the office like an old lady because my legs felt so weak. As soon as I got home I went straight to sleep and never went back into the office again. I pushed myself too hard - and my body has never recovered from it. "I was working part-time from home for a period of time but that was still a struggle. I’d work for four hours in the morning and I’d just sleep all afternoon. And then I’d sleep for ten hours at night… it was just constant." I got referred to a chronic fatigue clinic and they diagnosed me with ME again. Being diagnosed was a relief, because you’re being told that you have got something wrong with you and it’s not all in your head. On the other hand, I’d already been through the same diagnosis as a teenager so knew there wasn’t much that could help me. It was an answer, not a solution. I definitely felt mixed emotions. How would you summarise ME/CFS for someone who had never heard of the condition? The main symptom for me - though not for everyone - is fatigue. It’s not the kind of tiredness you’d ever have as a healthy person. As a healthy person, you’d feel a bit tired, go home and watch some TV, and that would be it. You’d have an early night and you’d recover - you’d feel fine the next day. ME/CFS isn’t like that. I don’t remember what it feels like to not feel tired. It’s been so long since I haven’t felt tired and those levels fluctuate throughout the day but the fatigue is always there. Symptoms such as muscle aches and muscle weakness are also pretty common. The hallmark symptom is that if you overexert yourself you have a delayed response which is called post-exertional malaise (PEM). Around 24 to 48 hours after you’ve overexerted this delayed response will suddenly hit you out of nowhere. From being able to work and gets things done you can become bedbound for several days. The severity of your body’s reaction depends on how much you’ve overexerted and how often you're overexerting. This can last two days, two weeks, or it could be the start of a relapse. As such, you're always trying to keep within your energy envelope, as it were, in order to manage your symptoms. Obviously, you have to overexert every now and again to live your life a bit and not just do nothing the whole time. "There are lots of other symptoms like cognitive problems, so brain function is a big thing for me. Being able to think clearly... I can’t concentrate on something for more than twenty minutes. Learning something will be an even shorter time than that. I have to rest afterwards and that’s it for the day - that’s all I can do with my mental exertion." Sometimes it feels as though there’s a big cloud on your brain and it’s not making the connections it should be making. You’ll be looking for a word and you’ll come out with something completely different! For me, that’s a big barrier to doing what I want to do. What advice would you give to someone who has been diagnosed with ME/CFS? The best thing to do is to learn to pace. Figure out how much energy you can use without overexerting, but use enough to ensure you’re doing something. Finding that balance does make things a lot easier to cope with, because when you’re overexerting all the time you keep feeling a lot worse, which is emotionally hard to deal with. The other thing is to have lots of rest. By resting I mean lying down in a dark room with as little noise as possible. A lot of people with ME will naturally just crash in the afternoon and nap for three hours or so. I rest for the same amount of time but will spread it sporadically throughout the day. Instead of one big nap, I’ll rest in twenty minutes intervals about four or five times a day. Although it seems to take up a lot of your time, I find it allows me to function better and get more done. How has using Echo changed how you manage your condition? Having ME/CFS means I can’t rely on being able to get to a pharmacy. If I’m feeling really rough, I might not be able to get to my nominated pharmacy in order to pick up the drugs needed to manage my condition. "Having the meds sent to my house and being able to do everything in one place is brilliant. 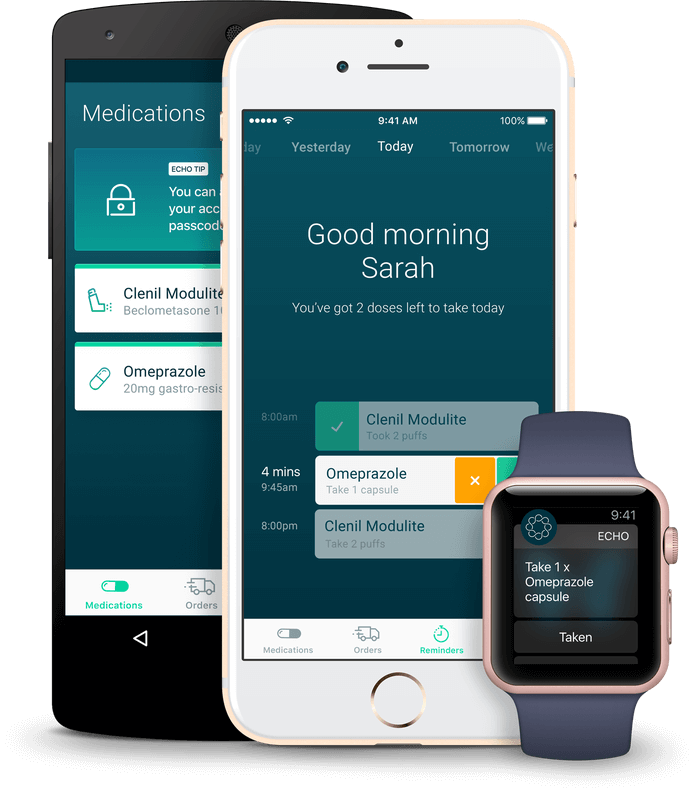 The Echo app also reminds you to reorder when your medication is running low, and that’s great because I’m not always on track with that." I find that Echo is a lot easier to use because the online patient system that doctors use seemed a bit haphazard and things would sometimes go missing. Now, I don’t have to stress about whether my medications are going to turn up. If any problems have arisen the team at Echo have always been on it and have messaged me saying “your doctor’s taking a little while to come back, we’ll get in contact with them and see what’s going on”, and they’re always on top of it. It’s really great. How has blogging about the condition influenced your own wellbeing? I was in the midst of quite a big depression when I started blogging, and I wrote a very long post about figuring out who you are while getting through a chronic condition. You’re very isolated when you’re housebound or bedbound and you feel like you’re the only person going through it. Blogging represented a way to get out certain emotions and connect with other people in similar positions. "Publishing a blog post gives me a sense of achievement that I would otherwise get from work. It gives me a sense that I am making a difference - albeit a small one - to the lives of people who are reading it, connecting with it, and feeling less alone." Having low energy levels means my opportunities to make a difference are limited, so writing makes me feel as though my life is worthwhile. I feel like I’m here for a reason and I’m helping other people. What else needs to happen to foster greater awareness of the condition? I think we’re on the tipping edge of things starting to happen that will change our lives for the better, even if it might take a while to get there. Obviously, research takes a bit of time even after we’ve managed to secure funding. I feel hopeful that things are going to change, though. When I first got ill again that hope wasn’t there. But the things that have happened in the last few years - the #MillionsMissing protest, the Unrest film - make me feel that progress is being made and people are starting to notice. I was actually one of the Kickstarters of Jennifer Brea's 2017 documentary Unrest, which was made at a time when I’d just become ill again. Since I was a teenager no real progress had been made with regard to ME/CFS treatment and it felt as though the condition had been ignored. Unrest represented a real spark of hope. The film itself is great, and the fact it’s on Netflix is brilliant and gets more people to engage with ME/CFS. It’s a really honest, open documentary and I hope people enjoy watching it. I think it has been a useful tool to show politicians and people involved in those decisions about whether we funding and things like that. Jennifer has also been involved with ME Action - the charity that organised the #MillionsMissing protest. ME/CFS is debilitating and isolating for those living with the condition, and many will struggle to find appropriate help and support. However, support networks are growing, and an increasingly prominent online community of ME/CFS sufferers is making waves in terms of raising awareness. The #MillionsMissing protest is clear signal that people are standing up and taking notice - and this is a vital step towards securing funding for further research into the condition. There's a lot yet to uncover about the illness, as this Guardian article about whether or not ME is physiological or psychological explores. The more public awareness that ME/CFS attracts, the better the chance that people living with it will see an increase in their quality of life. And it's blogs like Laura's Pen and films such as Unrest that are helping to place the condition firmly in the collective consciousness. To celebrate International Women's Day 2018, we talk to the Echo team about being female in the tech industry. For Migraine Awareness Week, we spoke to migraine sufferer, Dave, about coping with the symptoms, smashing the stigma... and jam sandwiches.